It was a matter of great importance, and the morning wind that carries the mist and the butterflies carried the news in a kind of dance, like the laugh of the first baby, when it broke into a thousand pieces and was the beginning of faeries. But what had been born was only a little stag, with wide, glassy eyes, uncertain on its knobbly legs. There were stags born in the forest every day, and doe-fawns too, with brushy eyelashes. But faeries didn’t come to visit all of them, and a faery came to visit this one. She sat up on a spider-web and watched his wet coat dry as the sun came up. There was something very particular about his coat, for it was white, and a white stag is not born every day. Indeed, in those days, you might live to be a hundred years old, and never see one. “Think away,” said the faery. “I can wait.” And off she fluttered, like a band of rainbow into the fog. 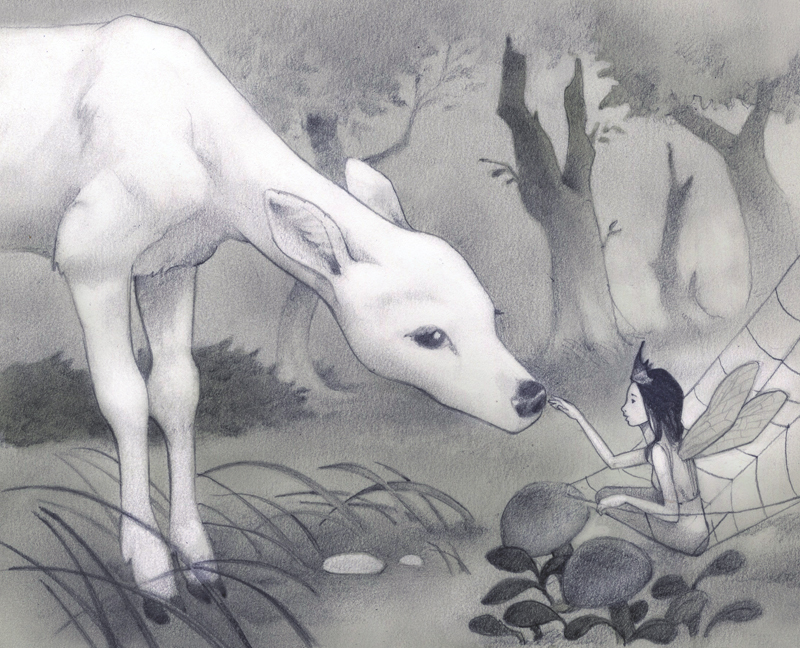 The little White Stag began to think very hard, but his small head was mostly empty, for he had seen only the soft grass-nest he was born in, and his mother’s warm fur, and the white tails of two rabbits that had bounced past him, and the spider-web, and the flash of jeweled green on a dragonfly. However, this state of affairs did not last long, for baby deer grow very fast, and the White Stag was walking in only a little while, and the next day he was so steady on his legs that he chased the rabbits all the way into their briar-patch, and stood blinking in the sun, disappointed. His brother raised his head and took a long snuff of the clean woodsy air. “There are three things,” he said. “You should smell every last drop of the pine sap and the rainwater and the big billowing grasses in the clearings. That is the first thing. The second thing is to grow strong and wild and majestic, and lock antlers with other stags and conquer them. 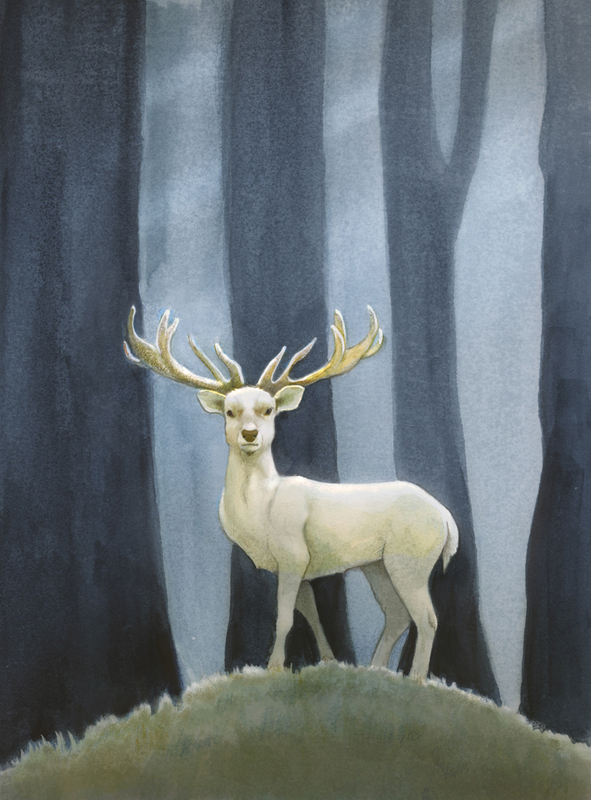 The third thing,” he looked down on the little White Stag and grinned with a sort of vast delight, “is to run your heart out.” With that, he went bounding away into the forest, leaping over thickets and saplings and leaving the little White Stag looking after him wistfully. Spring slipped away into summer and autumn, and the scent of white blossoms and the symphony of frog-songs on the creek gave way to musty leaves and the geese chattering overhead. And the little White Stag grew taller and firmer and sprouted a tree of bone on his own head, and took his brother’s advice. He smelled the pine sap and the rainwater and the billowing grasses, and a great many other things besides. He grew strong and wild and majestic, with long white hair that shone in the moonlight, and a chest like an oak-tree, and he bested all the other stags in the forest. More than anything, he ran his heart out. The peasants who lived on the edge of forest spoke of the ghost of lightning that streaked through the woods like a feathered white arrow, and the White Stag saw their wonder and reveled in his magnificence, and laughed. And winter melted into spring and summer and cicadas tittering in the trees. But one day when he was running, he ran into something that disturbed his peace, and spoiled the wonder of living forever. In a thicket on the forest floor, he found a doe lying. Her fur was torn and bloodied, and her eyes sunken and still. And a great chunk of her body was gone, with only ragged edges of meat left, and the white bones of her ribcage. The White Stag felt a sick horror making a fool of him, and he fled as though the king’s hounds were after him, all the way to the little grass-nest where he was born. There he curled himself up like a baby fawn and tried to breathe quietly. “Well,” said the faery, startling him. The faery’s twinkling smile faded into a solemn expression. “You will die, of course,” she said. 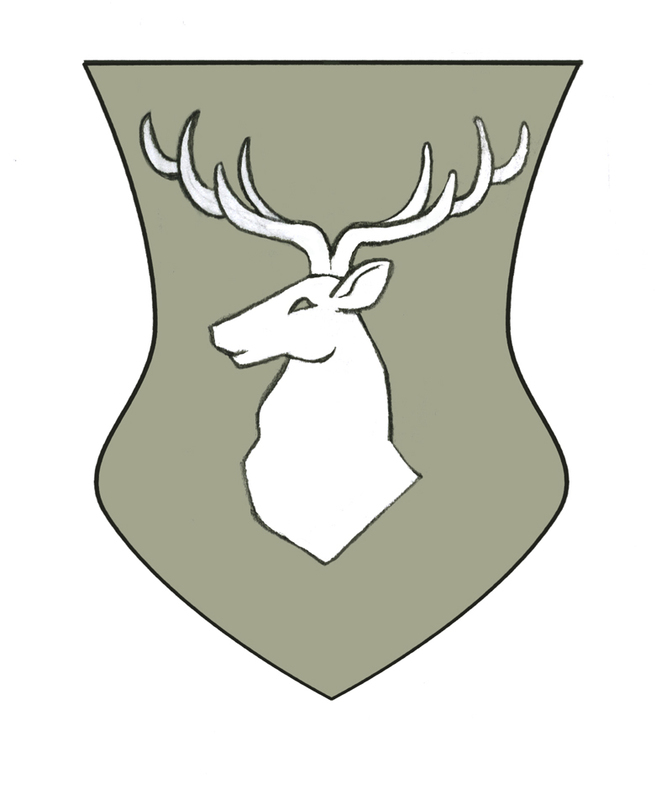 The White Stag raised his head with pride. “I am just the sort of creature to adorn a great castle,” he said. After this, the great White Stag grew haughty and aloof, and as he grew bigger and broader every day, he thought only of how glorious his frame would look on the walls of a king’s castle. Each time he passed a mirror of pond-water, he relished the idea of the immortalization that was coming to him. That winter was the coldest that had been known in the forest since the White Stag had been living. The snow was drifted in heaps about the bases of the trees, and the world was a fantasy of white. One day, as he went threading his way through a fresh blanket, he came upon something he had never seen before. A small fire was sending curls of smoke up into the colorless sky, and a young peasant stood beside it, with his face turned away from the ring of the fire, looking out into the woods. He was thin and bony, with a sharp chin, and hollow dents in his cheeks. His clothes were worn, and his lanky legs scored with scratches beneath them. 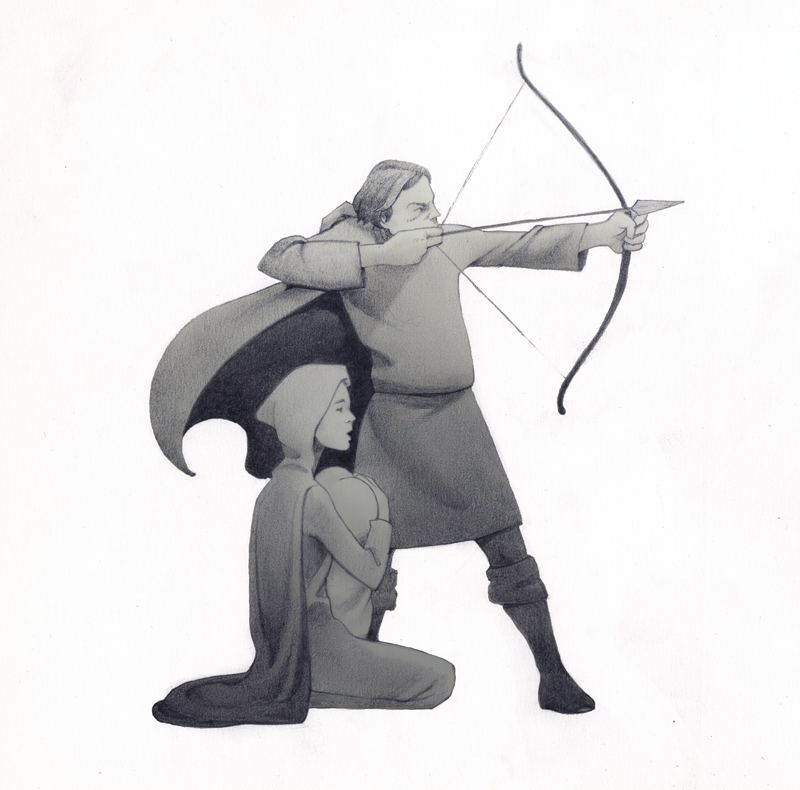 Slung over his back was a little quiver with only one arrow nestled inside it, and a longbow hung on his arm. “My love,” the young man was saying to a girl who sat huddled before the fire. But he turned away from her as soon as he had looked at her, for his voice was husky and wobbly. He paused for a long time. “My love, I think there is only a few days’ journey ahead,” he continued, when he was able. Then he stepped out into the open. An arrow twanged. His bones turned into dirt and the wind blew them away.